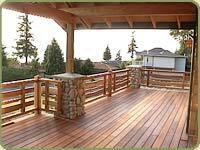 Using Western Red Cedar decking is a good way to increase your homes value and overall appearance. By using Western Red Cedar to build a deck you can extend living space to the outdoors, make use of damp or uneven terrain and give a contemporary look to a traditionally-styled home. The choice of which wood specie to use for your decking can be as an important decision as the design and construction of the deck. By using Western Red Cedar you are making a environmentally conscious decision to use a renewable and sustainable products. When planning for a deck it is important to understand that your decking will last longer and hold up better if it is protected against decay and insect attack. Western Red Cedar decking helps in this end as it has its own preservative oils and its freedom from pitch and resin makes it an excellent base for protective coatings. 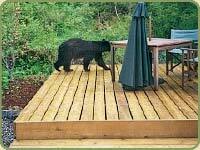 It is also the most stable of British Columbia's softwoods, so your decks stay flat and straight and resist checking. 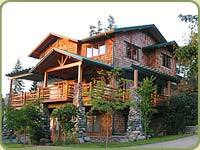 Western Red Cedar decks are firm but resilient underfoot, not hard and unyielding. The wood is light weight, easily worked and ideal for almost all decking applications. 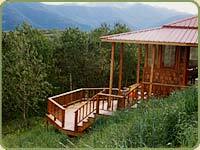 It has a fine look that complements any architectural style and a beauty that blends into all landscapes. 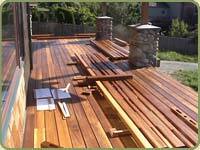 Western Red Cedar decking is available in a wide range of grades, sizes and lengths. 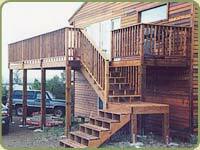 Decks made with Western Red Cedar are a beautiful, practical, long lasting complement to any home. 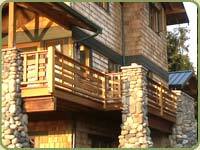 To get a quote on Western Red Cedar decking, go to our Request For Quote Page. Cedar decking can come in a range of sizes and which works best for you will often be based on which look you like best. It is important that the size of decking you select works with the deck joist layout that is designed so the deck boards have the proper support. When ordering your decking it is important to understand that we sell material based on their nominal size rather than a net size. 5/4" nominal thick material is going to have a net thickness of 1". 2" nominally thick material is going to have 1-1/2" net thickness. Widths are a bit trickier, with decking material that is 6" and narrower are going to have the net widths being 1/2" under the nominal width callout and decking that is 8" and wider will have the net widths being 3/4" under the nominal width callout. Western Red Cedar decking is available in a selection of thickness, widths and lengths. Maximum spans for decking need to be taken into account when designing a decking that is specified to use Western Red Cedar. Maximum spans for decking shown below are based on a continuous beam with two equal spans and a concentrated load of 220 lb at the center of one span. The true span of the decking board is used, taking into account the thickness of the supporting joist underneath it. Wet end use conditions and unseasoned (green) lumber sizes are assumed. TO COVER 100 SQ. FT.
Cedar grading can be a bit confusing at times as there are multiple grading agencies and each has their own terminology. 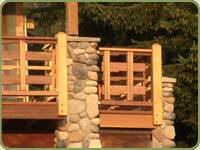 The above grades are what Bear Creek Lumber can offer from what we obtain from our mills. If you are not sure of what the grade you are purchasing entails, feel free to ask your sales representative for further explanation and pictures. Hot-dipped galvanized, aluminum and stainless steel nails are all corrosion-ressistant and all can be used to nail Western Red Cedar. Other types of nails, such as electro-plated, are not recommended. They can rust and disintegrate and reast adversely with the natural preservative oils present in Cedar, resulting in stains and streaks. Copper nails also react with Cedar and should not be used. Stainless steel is the best choice but hot-dipped galvanized is the most widely used and economical. Use 3" (10d) nails to fasten decking with nominal thickness of 2" and 2 1/2" (8d) nails on decking with nominal thickness of 1 1/4". This will allow for nail penetration of approximately 1 1/2" into deck joists for secure, trouble free construction. Deck boards 2" wide need one nail per joist while 4" and wider decking requires two per joist. To prevent wood from splitting, use thin shanked nails with blunt points. Screws can also be used to fasten decks. Double hot-dipped galvanized screws can be used, however, stainless steel screws are recommended. For most applications a 304 (18-8) grade provides adequate corrosion resistance. For decks exposed to salt air, use 316 grade. Screws must be long enough to penetrate 1" into support members. Penetration of 1 1/2" is required for structural components. 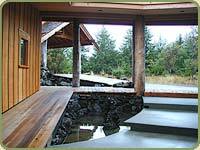 Although Cedar is naturally durable, a surface coat is recommended to protect the wood and extend its service life. Cedar accepts a wide range of stains and other coatings and whichever is selected should be a good quality product recommended by a paint or building supply dealer. When selecting a finish coat, make sure it contains the following: Water Repellent, Fungicide/mildewcide & Protection against ultra violet light. 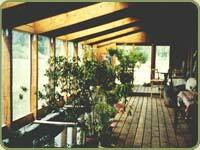 Penetrating oil-based products, particularly those containing pigments, are recommended for cedar. Pigments provide increased UV protection. 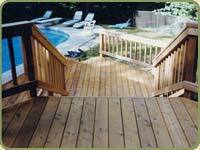 Note that decks require products specifically formulated to withstand the abrasive effects of foot traffic. 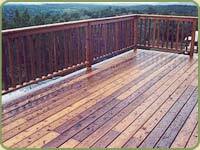 Use of varnishes or toher types of film forming coatings are not recommended for cedar decks. These coatings can crack and peel and once applied are difficult to remove. Also, avoid non-drying coats as these often feel sticky underfoot and can result in stains on interior floor coverings. 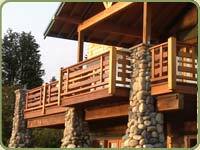 A few good resources for researching Western Red Cedar on our website are our Specify Western Red Cedar Decking PDF document, our Western Red Cedar technical information page, or the Western Red Cedar species page.